Two of the "Five Dancing Israelies"
But how did they know there was going to BE an "event"? 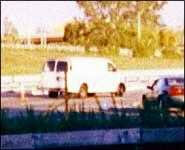 A Mossad "surveillance team" made quite a public spectacle of themselves on 9-11. The men set up cameras by the Hudson River and trained them on the twin towers. "They were like happy, you know … They didn't look shocked to me" said a witness. It was later confirmed that the five detained Israelis were in fact Mossad agents. (Forward Magazine). They were held in custody for 71 days before being quietly released. Some of the movers had been kept in solitary confinement for 40 days. Said one of the men, denying that they were laughing or happy on the morning of Sept. 11, "The fact of the matter is we are coming from a country that experiences terror daily. Our purpose was to document the event." How did they know there would be an event to document on 9-11? 4. But the police react very wisely and proactively by closing off ALL bridges and tunnels instead of just the Holland Tunnel. This move inadvertently foils the Israelis' misdirection play and leads to their own capture and 40 day "torture". The compliant mainstream media completely ignored the Israeli connection. 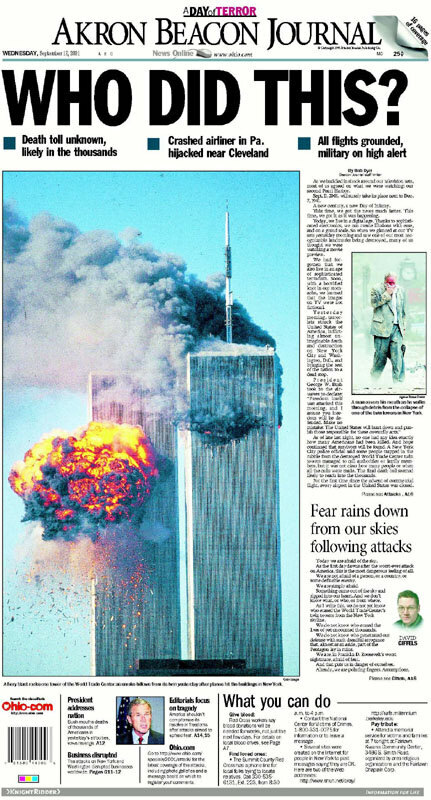 Immediately following the 9-11 attacks the media was filled with stories linking the attacks to bin Laden. TV talking-heads, "experts", and scribblers of every stripe spoon-fed a gullible American public a steady diet of the most outrageous propaganda imaginable. We were told that the reason bin Laden attacked the USA was because he hates our "freedom" and "democracy". "I was not involved in the September 11 attacks in the United States nor did I have knowledge of the attacks. There exists a government within a government within the United States. The United States should try to trace the perpetrators of these attacks within itself... That secret government must be asked as to who carried out the attacks. ... The American system is totally in control of the Jews, whose first priority is Israel, not the United States." The FBI has no hard evidence connecting Bin Laden to 9/11, but there is a mountain of evidence which suggests that the Zionists (and there willing contrivers) have been very busy framing Arabs for terror plots against America. "I think there is very compelling evidence that at least some of the terrorists were assisted not just in financing -- although that was part of it -- by a sovereign foreign government... It will become public at some point when it's turned over to the archives, but that's 20 or 30 years from now." the NYFD decided to 'pull' WTC 7 on the day of the attack. The word 'pull' is industry jargon for taking a building down with explosives.